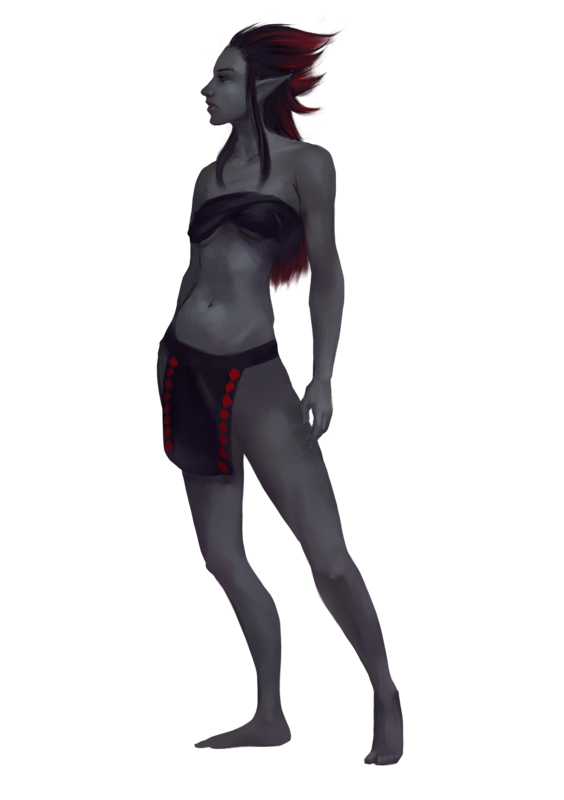 Qweldint, also known as Shadow Elves, being born under ground, or in areas of complete darkness, are typically shunned by all other Elven races, and usually turn to Ravis at some early point in their lives. They have a dull black or grey sheen to their skin, all Qweldint have black hair and black eyes. Qweldint cast very dim shadows, a feature that has earned them the common nickname "Shadowless". Qweldint have no major civilizations above ground, and little is known of their cities below the surface. Qweldint are often disliked by all other prime races and usually return the feeling out of spite. Most Qweldint lean to the Lawful side of the ethical compass, as they usually develop a code of conduct while living in solitude. Most Qweldint also lean to the Evil side of the moral compass, taking advantage of situations that further them. Good aligned Qweldint are rare indeed, and usually have a hard time gaining the trust of those around them. Abilities: +2 Int, +2 Wis -2 Con: While more cunning than the other Elven offshoots, they lack the physical heartiness of other races. Medium: Qweldint are medium creatures and have no bonus or penalty due to their size. Normal Speed: Qweldint have a base land speed of 30 feet. Improved Darkvision: Qweldint can see up to 120’ in darkness. Immune to sleep effects: Qweldint require the same amount of rest as Elves as described in the core rule book and are likewise immune to magical sleep effects. Shadow Grace (Su): Qweldint gain a +2 Racial Bonus to saving throws against supernatural and spell like abilities. Shadow Magic (Su): Qweldint cast spells with the Shadow descriptor at +1 level. Shadow Guard (Su): Once per day as a standard action a Qweldint can call upon the plane of Shadows to conceal their location. This functions as a Blur spell with a caster level equal to the Qweldint's character level. This effect lasts for 3 rounds or until the Qweldint dismisses the effect as a free action. This effect does not work in an area illuminated by daylight or a Daylight spell. A Qweldint can use this ability 1 additional time per day at 10th level. Naturally Distained (Ex): A Qweldint has a racial -2 penalty on all Diplomacy checks.